If you want to read a good book, try Marina Nemat's memoir, "Prisoner of Tehran." It's the story of her teenage years as a political prisoner in Iran. She was arrested because she walked out of class (at the teacher's order) after asking the teacher to teach math rather than politics. When most of her classmates followed her, it was assumed she was a communist leader! She would have been executed after being tortured, but her interrogator fell in love with her and saved her life--reducing her sentnce to life in prison rather than death by firing squad. Later he forced her to marry him--when she tried to refuse he said if she didn't he'd have her family killed. Anyway, it's an amazing story and I won't tell any more of it. Read it! Being married to Matt, the Saver of All Things Environmental, makes me feel guilty about having a house with central air. Unlike a lot of people with air conditioning, we do not turn our air on when it first gets hot and leave it on till the leaves start changing color. Seriously--our neighbor in our old house ran her air from May till October, even though the nights on Long Island are often in the mid to high 50's even in July and August! We take a much lighter take on using the air. On the days it's hot enough to warrant it (and here we are at the end of July, and I think we've only used it 10 or 12 days so far) we leave the windows open until it's uncomfortable. Then we seal up all the windows and put it on at 70 degrees. After it's cooled to that, we nudge it up to 72 or even 74. Then we watch the conditions. If the heat dissipates at night, off it goes and the windows are opened after the chill is gone. If we're going to leave it on for another day, we make sure it won't be too cool for the night. Then when Matt gets up early for work, he puts it down again, to cool it off using the least energy (when it's coolest outside) and I turn it back to 72-74 when I get up. Having said that, when the days and nights are hot and humid--it's been going in cycles this summer, with a week of stunningly perfect weather, then a few icky humid days, then maybe a day or two of rain, then back to perfect--I am happy to be an energy-hogging American with a cool, comfortable house! Which I guess, you could argue, is the problem with being an American!!!! If you think dogs can't count, try putting three dog biscuits in your pocket and then only giving him two of them! Yesterday we decided to drag the wading pool out of the shed. This would be the first time we've used it since moving into this house. Reason one: we live at the beach! Reason two: we have in ground sprinklers now, so the kids often just run through them, having a blast with no effort on my part! However, we were looking for something new to do, and Julia got a little rubber fish as a prize at the library, so they wanted to have a place for it to swim. So out the pool came, filled with icy hose water, and in went three (and later four) kids. Emma's comment while I was filling the pool, while she was putting on her suit, and the first ten minutes they were in there? Women and cats will do as they please; men and dogs should relax and get used to the idea. Although it goes against my grain to even think about school when July isn't even over, I have to be practical this year. With Ben going into Kindergarten, therefore leaving me with three lesson plans to do, the time is now. I began with Ben because the younger the child is, the easier the lesson plan is to make. This is the first time I am beginning school with a child who doesn't yet read, so my main focus is on that. However, he shows all the signs of being on the brink of reading, which is nice. He can write several different words--Ben, Emma, Mama, Hess, love--without any help. He asks how to spell words all the time. He puts letters together in nonsense patterns and asks what that spells. And he even comes out with surprises, like when he told me that "ooze" was spelled O-O-Z, or just this morning when he pointed to the egg carton and read "eggs". I felt a bit guilty on Sunday because I quizzed him with a story book that had the alphabet on the cover. I kept asking him to show me different letters, and he got them all right. And then we sounded out the word cat (which in retrospect was a bad example because C is such a confusing letter!) --and then I asked him how to spell fat, mat, bat, rat, sat, vat, hat and pat--and he got them all right, too. So he's just fine, especially since he won't even turn 5 till next week. Basically, every day we'll do some phonics/reading workbooks, we'll practice writing letters--he wrote the entire alphabet by himself for the first time yesterday, but of course his technique could use some polish! Also, although he wrote left to right on the page, he began at the bottom of the page, so ABCDE was on the bottom line, and WXYZ was at the top of the page....Then I have two simple math workbooks on shapes and numbers, which I'm sure he already knows, but it's always nice to make sure there are no gaps, and it gives young kids confidence to breeze through things. I also got two workbooks from Kumon that focus on cutting and pasting, which can double for art and improving coordination and endurance for writing. Then there's science. I got a book I love called "More Science Through Children's Literature" that we'll be using. Basically it uses stories or age appropriate non-fiction to teach different concepts, and then there's a list of maybe 20 activities that range from art projects to experiments to journaling. The first one I chose is based on the Robert McCloskey book, "One Morning in Maine," and we'll learn about fish, the fishing industry, feathers and seabirds, and even dental hygiene. In 1st grade, Julia had the same book for Social Studies, and it was great, so I'm looking forward to it. Add in our music CDs (they combine singing, movement and simple instruments, with directions to the kids right in the songs) and there you have it. The greatest thing about Kindergarten homeschooling is that the child feels big--he's joining Lessons, he's now part of the pack of learners--and yet it takes about an hour a day! No muss, no fuss, and it's done. The 5 year old child needs plenty of freedom and time to run around--and he'll get all that while still doing school. None of this sitting in school all day and THEN coming home with homework--and I guarantee he'll learn more than he would in school, anyway! I only planned about 5 weeks for Ben, though, because I want to reevaluate at that point. If he's learned how to read in those first weeks, which he very well could, then a lot of the things I was using will be too easy. If his writing of the letters is very good, then I won't need to use the several alphabet books I have---one thing about homeschooling several children is that you usually have more than you need. When I went through materials, I found I had 4 different beginning handwriting workbooks--more than I have kids in school! So rather than press on with the planning and having to re plan later, I'll do less than I normally would and see where he is by the end of September. Last week Julia and Ben were playing outside and found a DOZEN eggs in a nest in the garden. They were not rotten, but when we cracked them we didn't want to take the chance eating them either. I suppose Marie and Scarlett have come to see the coop and even Lila's cat house as too dangerous to potential babies and are trying to be sly. The thing is, we didn't even notice that we were "missing" eggs--these two hens really lay a lot! So now the kids have to have an egg hunt every day...I have noticed that we haven't had as many eggs in the past few days, so I think they've found a new hidey hole. Another chore to tend to....sigh! No, we didn't get a new pet! Pig Pile is a charming game, invented by Julia (of course), which involves kids and any unwitting parent who may be reclining in bed piling on top of each other....for the first few moments everyone is happy, and then someone shifts position and chaos ensues. Either that, or Emma, who naturally is always the "top pig," can't maintain her balance and rolls off onto the floor. Anyway, what's really funny about the game is that we can be cruising along, just snuggling or hanging out reading, and one of them will happily announce, "Pig pile!" and they all gleefully stop what they're doing and flock to their places. I wanted to put it on here because it's one of those games that can be talked about (probably embarrassingly!) all through a family's history--but it's also something that could be easily forgotten. I didn't want to forget it. Anyway, we all had a fantastic time with Grandma, and there were tears when she said goodbye to the kids last night...Matt got up early to drive her into Queens to get her flight home, and none of the kids were up, so they said goodbye last night.) Julia declared it "totally unfair" that adults don't have the whole summer off the way kids do, and we all had to agree. We will miss Grandma, but will as always keep in touch by phone, email and CARE packages. Today has been a quiet day. Matt returned from LaGuardia bearing donuts--the kids were so excited they nearly knocked him over! We had coffee (a tea party for the kids) with those while we talked. Then I took Rachel to the library for her first afternoon of volunteer work--she helped kids make Harry Potter crafts and "supervised" the showing of the movie...pretty good work if you can get it! I ran to the market and home to put stuff away, but then went back and read on total silence for the remainder of Rachel's shift (another rare treat!) I came home to Matt finishing up mowing the front lawn while the other kids rode their scooters, drew with chalk, and played various things in the driveway. After a light dinner we'll go downtown to the Blues Festival playing this weekend. In the coming days the daily quote will be about dogs. Thanks to my friend Carol, who sent them to me. Some of them are so good I have to share, and it's fitting, because we have two dogs this month--my parents' greyhound, Silkie, is having her summer vacation with us while they're in Europe visiting my sister Amy. Even though Silkie is not what I would call a dog--she never barks, jumps, sheds, or even moves a whole lot--having two dogs in the house is more hectic than having one! She is so lovable, though, with her huge eyes and pointy nose, and when she does come for attention (rarely) you notice, because she either leans her entire weight against you or pokes her nose into your hand. I consider myself much more of a cat person than a dog person, but there is truly nothing like a dog. We give dogs time we can spare, space we can spare and love we can spare. And in return, dogs give us their all. It's the best deal man has ever made. Ben, staring at the water. For the first 3 hours I painted today, the kids were great. Ben and Emma had TV time, and then each played a game alone. Ben was playing upstairs while I was on the stairwell to the 2nd floor, and he was really into his pretend life. And Emma was playing in the box clubhouse the kids made this week (we got a bistro set to add to our existing patio furniture so we don't have to carry chairs out of the house when we want to eat out there, and the box was really big.) She had dolls and animals, and had a whole fantasy life happening. 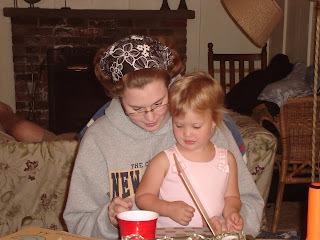 Rachel and Julia were pretending to be Amish girls in the family room (yes, Amish!) and I was singing along to "Hotel California" happily while I painted. However, as any parent knows, whenever the kids are playing nicely and you are getting something accomplished, it will soon END! And it did--Emma wanted to "watch me paint," which over the last five days have become my most dreaded sentence from her lips. It consists of getting too close to whatever I'm painting, getting some appendage in the paint, and me trying to be nice but usually losing it and yelling....then Ben came along complaining Rachel and Julia weren't letting him play, and the girls protesting that he didn't want to play Amish family, blah, blah, blah. Whatever. I snapped, and pointed out that since I was the one busting my hump to make our home a nicer place, the least they could do was play nicely. I further added that bedtime would be directly after dinner if they couldn't get along...so they dressed up for a while and then made cookies. I have to admit, I cooked a lot with Rachel when she was tiny, and even a bit with Julia. I don't mind one kid helping, sometimes two is OK. But more than two--it gets crazy! They all want to do whatever job it is, they all want to see into the bowl, etc. I can't stand it. I only invite help while cooking if I can't avoid it. But Rachel handled it well. She put the mixing bowl on the floor (eliminates falling off chairs/the I can't see! wails too) and made them stay in strict age order for adding things to the bowl, mixing, and dropping the cookies onto the sheets. They were peanut butter chip cookies, and came out delicious. Extra bonus--Rachel did every dish in the sink afterwards, even bowls from earlier fruit salad and the dog dish soaking in the sink! Yay! I am really getting to love this garden of mine! 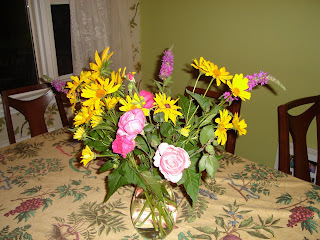 It is so lovely to walk outside and pick a bounty of pretty flowers to put in the house. 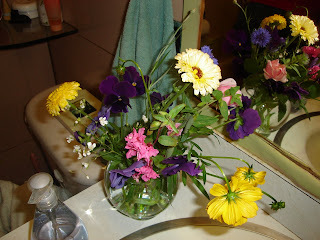 I picked more of the bright yellow Montauk daisies, tiger lilies, and some sort of purple butterfly bush flower. They look so nice all together in a big glass vase on the dining room table. Also, we see so many butterflies around the garden because of the lovely flowers. There are more flowers budding--I'm excited to see what they will be. There's a section of the garden that looks like lilies of some sort (the foliage is the same) but for some reason, they are always trampled to the ground. I know it isn't the kids--the chickens do go in there a lot more than I'd like, but I don't think they're big enough to do so much damage. It might be Sophie, I guess--but I never see her in there. I think that if nothing blooms this summer, I'll pull it up wholesale and plant my own selections. Now I'm getting confident! I got a garden catalogue the other day and was looking at many different perennials, thinking how pretty they are but how I really don't have room unless I start digging more beds (which is about the last thing I want to do!) So that might be the ticket; pulling up some old things and adding new. There's also a hosta or two--which I find very boring, and since it is anything but a shady part of the yard, I'm not sure why they were even planted there--that I could get rid of. I'd like to add some more colors, as the former owner favored yellow, orange and purple. I like those colors too, but wouldn't mind some pinks, reds and blues added in for variety. The blueberries are also doing nicely--we pick some every day. The birds don't seem to be getting under the curtains I put over them. (Or if they are, there are a lot of berries on those bushes!) If we only had fewer kids, we'd actually be satisfied with the amount we pick....but anyway, they are delicious. We picked our very first tomato today! This is the first real tomato I have ever grown, by the way....when we lived in Iowa we had a pot of cherry tomatoes on the patio which we thought were doing well, but in the end gave us only about four tomatoes. Our plants here are doing beautifully--we have another one almost ripe, another five or six that are green, and many clusters of grape and cherry tomatoes. I am so excited! I sliced it into our salad tonight, and it was truly beautiful. Deep red, juicy, not a lot of seeds. The best smell, and tasted much better than any of the store tomatoes. I was at this restaurant. The sign said "Breakfast Anytime." So I ordered French Toast in the Renaissance. I finally got my order together to get the kids' curriculum for next school year. It's a fun job, I have to say, even though I keep wanting to put the brakes on summer so we never have to get to September again....I wanted to make sure to order early this year so that I can plan--last year with moving it was really hard to be organized and we started late. However, I found some really neat things that I'm excited to teach, and I did quite well even though I didn't shop around. My favorite homeschool catalogue, bar none, is Rainbow Resources. It's something like 1500 pages long, but the reason it's so long is because the family that runs the company reviews every product and really explains it. So I feel much more confident that it will fit our needs, and because they have so many choices I really feel like I'm narrowing down to the best possible one for each child. Matt and I talked about trying to find the books individually, say through Amazon to get better prices, but really, who has time for that?? I'd end up getting sidetracked, maybe changing my mind, having it ship in 20 different boxes because Amazon uses so many suppliers, etc. And although Rainbow Resources espouses some ideals that I do not agree with whatsoever--evolution is a dirty word, your daughter should want nothing from her life except what some future husband wants for her, etc.---at least it's a family business so I like supporting that. 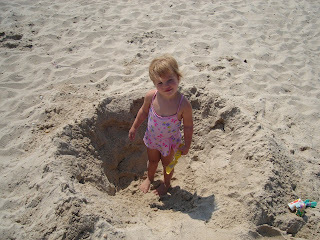 This is the castle that my kids, nephews and nieces made on our beach vacation. 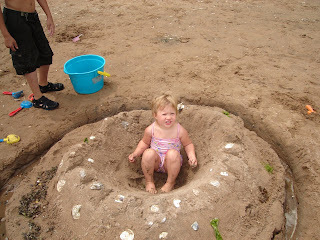 They worked really hard on it, all together, digging and finding just the right shells to decorate it. By the time we left the beach that day, it was completely in the water, looking like a little pool. Emma liked sitting in the middle! I had just been bemoaning the fact that except for the tomatoes, which are doing very well, my attempt at a vegetable garden this year has been pretty unsuccessful--but then we came back from our vacation in CT. I'd gone outside to check on the tomatoes, which had all been green before we left, but at least there were several large ones on the heirloom plant, and a tiny cluster or two on the grape and cherry plants. I wanted to see if they'd ripened or grown more--and they had. One large one was turning red, others were forming, the green ones had gotten bigger, and the cherry and grape plants had fairly exploded with clusters. So I was happy about that--apparently chickens don't find tomatoes appealing. There were peas and beans all over the vines! The purple ones were so gorgeous they were nearly unbelievable. Dark, shiny and nice, with remnants on flowers at the top. The green and wax beans were just as I remembered picking from my Grandma's garden, and the peas had gotten a bit too large, but I still gleefully snapped them off into my basket. And two small cucumbers are hiding under their huge leaves, so adorable. The eggplant has flowers on it, too, but no fruit, so we'll wait and see. However--there was one pepper plant that although mostly out of the ground still has something that just may be a pepper forming on it. I almost tried to stand it up and bury the roots (again! the chickens keep yanking it up!) but then decided I should just let it be and see if it develops. Next year I shall have to invest in garden fencing!!! When we got home from Connecticut two days ago, the garden was glorious. I picked bouquets from the perennial garden in the backyard, the bouquet garden that I planted by the front walk this spring, which has been surprisingly successful (I have never grown flowers from seeds with any measure of success before) and tossed in some roses from the bushes on the side of the house. They are lovely and make me very happy. Well, we are home from our vacation in Connecticut! It was fun to be with (almost) all of our family again! We hadn't seen Uncle David and Aunt Donna's family for awhile, especially Anna, so it was very enjoyable to see them and celebrate Nicolas' birthday! 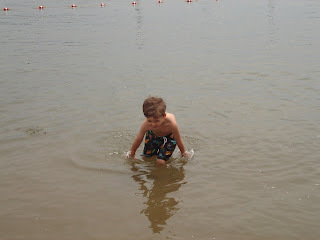 Here is Ben, in the water at the beach! 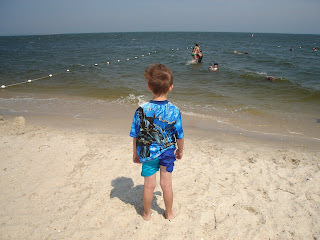 Finally he is overcoming his fear of the ocean! 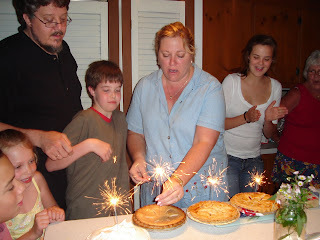 Here is Aunt Susan, lighting Nicolas' Birthday Pies with 4th of July sparklers! 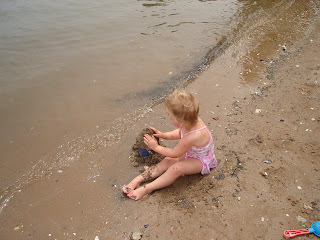 Here is Emma, playing with some seaweed on the shore.